Did you send us an email recently but then never heard back? We noticed that our email service treated 🎃 us to a one-way ticket to your spam folder! We think we’ve been able to determine what was causing it and are working on getting some answers from the culprit, but please check your spam folder if you’re still waiting on our reply. Don’t forget that you can also reach out to us on Twitter! Don’t want to wait for the email to show up to see how it looks? Now you can preview your email templates right in Order Desk. 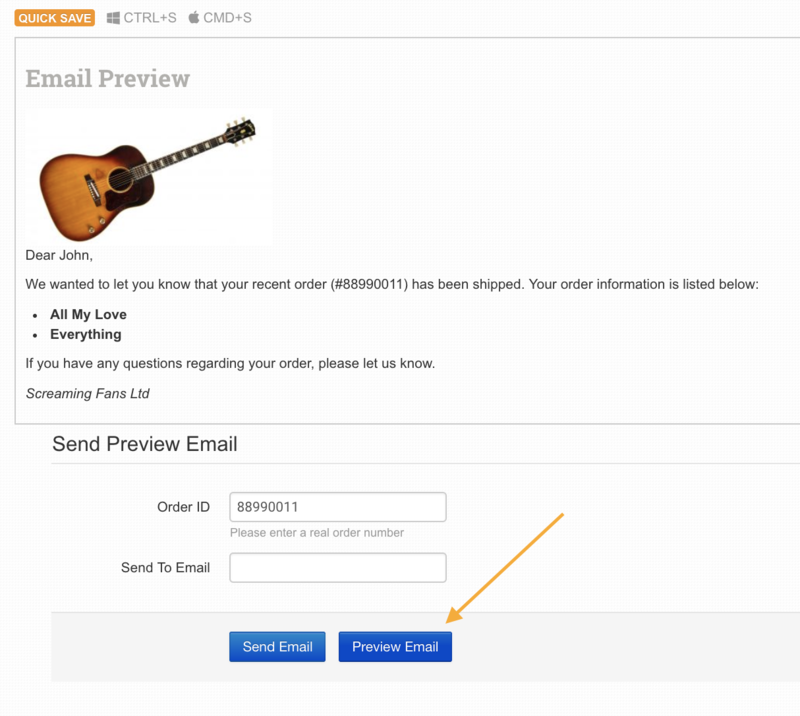 To see this in action, open up one of your exsting email templates, scroll down to the Send Preview Email section, drop in a real order number from your store, and click that Preview Email button. 😍 We should have thought of this sooner! There’s a new action in the rule builder called Process Manual Shipments. If you use EasyPost, this lets you decide when to run the shipment added event on your orders. More details here. A new custom field is available for your export templates. If you need to show the number of the lines in the template within their own column, use ‘current_line_number’. This is one of many custom fields available. See them all here. We have opened the gates! You can now download your untracked BigCommerce inventory into Order Desk. If the price you have set in your shopping cart is different from the price you have saved to your inventory item in Order Desk, we will honor the shopping cart price. However, if you have a reason to overwrite that price once your orders get to Order Desk, you can now do that using the new item metadata price_override field. Find out how that works here. Import templates have gotten two new improvements this month. The first is an alternate date format for those of you not in the US who think our date formats are a little… wrong. 😏 Choose the d/mm/yy format when setting up your import template matches, and you and our British developer will be a little happier. The second is a new manual mapping feature that allows you to set a prefix before the order number on import. To do this, add source_id_prefix = X (replacing the X with the prefix you actually want, of course) to the manual mapping area of your import template. We will now check Walmart twice a day for orders that have been canceled. If an order was canceled after it was sent to Order Desk, you will be emailed. You can also set up a rule to take other actions on the order when that happens. For more details, see this guide. You can now send gift messages to Printful. Like all integrations, this doesn’t happen automatically. Read these instructions to learn how to get your store set up for this. If you use the Duplicate Items button directly beneath the items in your order… you can duplicate the selected items in your order. This lets you add additional line items to the order for multiple quantities of a single item rather than multiplying the quantity of that item on a single line. Two new options with reports were built this month. You can now exclude specific item variations from the report, and if you were hoping for better monthly information, now you can create a report to show that monthly breakdown. You wanted more options with your imports, so you’re getting them! You can now import extra information into the checkout data and order metadata fields when importing a shipment file. Folder ID? What folder ID? We get it, those folder IDs were confusing. You just wanted to call them by their names, so now you can. When building rules, if you need to add a folder condition, choose the folder name from a dropdown. No more numbers that leave room for error. ShipStation should be working a little bit better this month. We won’t download shipments that have been voided, we will continue to attempt to communicate with ShipStation if your account has been rate limited, and we can now better handle third party shipping values. But that’s not all! We can now set the tag on an order we send to ShipStation by using the tagID field. District Photo now has improved error logging and returns. This makes it easier for us to troubleshoot when things don’t go quite as expected. If you were using refunds with the Shopify integration, turns out we were showing the refund box option for all the orders on your store. Whoops! You couldn’t have done anything with that, but we fixed it anyway. It’ll only show up on your Shopify orders now. The GB country code in the Gooten integration has been adjusted for added compatibility. If you use Asendia, the tracking link format we create for their shipments should be working for you now. CustomCat got a lot of updates this month. You can now set a preset_id and mockup_url field to your items, the order submission process has been improved and will be more reliable, we will do a better job of matching fulfillment_id values on incoming shipments and attempt to set the right carrier codes, and the catalog ID values will be displayed better so you can get the info you need more quickly. Your Wayfair orders will now have the phone numbers included when we download them into Order Desk. The Jondo Global integration has more accurate tracking URLs for DHL shipments. Specialty Fulfillment Center has a more reliable shipment response. We have two new custom settings that will sort your order items by either product name or product code. If you want your orders to display order items this way, let us know and we’ll set it up on your store. The Walmart integration is easier to set up and change because we now prefill the channel type values for you. We’ve improved the logic behind some of our country abbreviations. InkLocker is more reliable and stable. BrightStores orders will now have the shipping method included when we pull them in. Add comments to your BigCommerce shipments with a checkout data field called ShipmentComment. We’ll send that comment back to BigCommerce instead of “Received From Order Desk” when we tell them about the shipment details. Also, the BigCommerce integration will now run the inventory sync more efficiently and correctly. You can now set color and size options on your Dubow products. To do so, add an additional item metadata field of add_size_color|1, then add your size and color details as metadata or variations. We did a lot of behind-the-scenes work to improve the way we generate PDFs. International shipping options are now hardcoded into Order Desk for the Zift integration. This should make setting up your preferences a little bit easier. The holiday season is quickly approaching! We’ll be monitoring the app closely in preparation for the influx of orders you’re expecting. We will also continue to be available for your questions during US business hours and will respond as quickly as possible. As you probably are aware, Order Desk is a robust app. It can take anywhere from a few hours to a few weeks to set up or change your workflow. We recommend contacting us now if you think you’ll need help, so you are ready before the holiday rush starts. PS: Remember to follow us on Twitter, LinkedIn, and Facebook so we can learn more about your business. We want to help you succeed!